This article is a compilation of some information I have collected on GM's delay wiper system (as used on the 85-88 Fiero) from various sources. It is by no means complete. I appreciate any and all information you might be able to share about this error prone bugger. Some of this information may or may not be relevant to other GM vehicles, like the Firebird, Camaro, etc. Use your own judgement. On the 1984 Fiero, GM had used a separate control module with a gazillion (well, about 8 or 10) control lines to convert a dumb wiper motor into a system with delay. The new system consists of an electronic module located inside the wiper motor housing, the wiper motor and a delay switch located inside the steering column. The delay module is accessible by removing a single screw from the wiper motor housing, then removing the cover. (A - white) Battery power, hot with ignition in ACCY or RUN. This line powers the module and the wiper motor. (B - orange) Washer pump output. This line powers the washer pump if it is energized. (C - grey) Control Input. This is where the magic happens. This is where the module is told what to do. As you can see, the stalk performs the majority of the functions. If you turn on the ignition, terminal 1 should carry 12V. 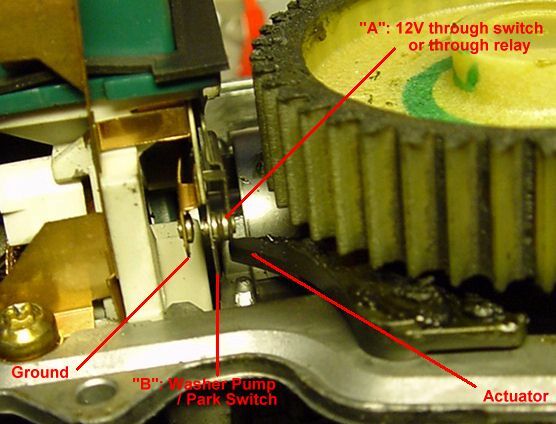 If you disconnect the connector at the wiper module and jumper terminals 1 and 2, the washer pump must come on. But how does the wiper switch control all these functions through pretty much only one wire? The answer is resistance. Inside the stalk is a fixed resistor, a variable resistor (or series of resistors) and a couple of switches. In Mist, LO or HI, the control input (terminal 3) is connected to battery power through a 360 Ohm resistor. This triggers the control module, and starts the motor. Once the motor is running, it is kept running until the wipers park, even if you return the switch to the off position. This is accomplished by the switch assembly pictured to the right (click on the image for a larger view). Inside the motor there is a switch assembly that normally connects contact "A" to contact "B". Contact A carries voltage from either the stalk or through the pulse wiper module, and feeds it to contact "B". This switch is closed whenever the wiper is not in park position. As long as "B" has power, the motor is running, and as long as the motor is not in park "B" gets power from "A" and the motor keeps running. In park, the actuator moves contact "B" away from "A" and shorts it to ground. So, once the motor hits park and the wiper switch is off, the motor stops. A side effect is the operation of the washer pump: The difference between the washer switch position and the Mist or LO position is that battery power is applied to the control line directly, and not through a 360 Ohm resistor. This power is fed through the switch assembly in the picture to contact "B", which is connected to the washer pump. So the only thing to keep the washer pump from coming on during normal operation is the 360 Ohm resistor: there is too much voltage drop over the resistor to allow the pump from working. And in case you were wondering if the washer pump stops when the wipers go to park: yes, they do. Try holding the washer lever and observe. But how does delay work? Delay operation works through the same control line. This time, battery power is applied to the control line through a resistor a lot higher than 360 Ohms: in the range of 10K-500K. This voltage is used to charge a capacitor on the delay module. If the voltage on the capacitor exceeds a certain threshold, the wiper comes on. If the resistor value is low, the capacitor charges more quickly, and the wiper comes on more often. When the motor is running, and there is voltage on the washer pump connection, this voltage is used to discharge the capacitor, so that the motor does not come on again immediately. When the wiper is in park, the cycle can start over. One thing to mention is the diode that is located in some switches. It is used to short the control wire to ground through the 360 Ohm resistor and the High-speed motor winding, when the switch is in the off position. But apparently this is not really necessary, because it is not present on all switches. How can I troubleshoot my wiper problems? Well, there are a million things that can go wrong with this system, because it is so complicated, as you have seen. Some of the easier things are to check if the pump works, to check for 12V at the motor, and to check for voltage at the control wire. Other than that, there's not much you can to other than replace the board (which cures 69% of the problems) or the stalk (which cures the other 29%). Both of which are expensive unfortunately, and the stalk is unpleasant to remove, so try the module first. Fortunately it is used in many cars, so you should find one at the local junkyard. The remaining 2% of the problems can be bad grounds, or a problem internal to the motor, like corrosion of the switch assembly contacts or other mechanical failure. One mystery problem is the "phantom wipe": the wipers coming on a single time when you first turn on the ignition. Some people have reportedly fixed this by replacing the switch, others by replacing the delay board. I have replaced both with units working on other cars, and the problem remained. After a while, a second problem appeared, namely the wipers staying on a random number of wipes after triggering a single dew wipe, or a spray wipe. Dave Layden pointed out that he fixed the phantom wipe by cleaning the park switch contacts in the wiper motor housing. That makes perfect sense, and corrosion on those contacts explains the phantom wipe as well as the random number of dew wipes. The car is in storage now, but I'll have to give that one a try when I have some time. If you have any stories to tell about the wiper system, I'd sure be glad to hear them!